This is the first time I've had coloured nails in quite awhile. I didn't know what I was feeling for but I decided to pick up Barry M "Indigo" ... Indigo is that colour that's between violet and blue in the bottle it screams a dark purple but on the nails it appears differently. 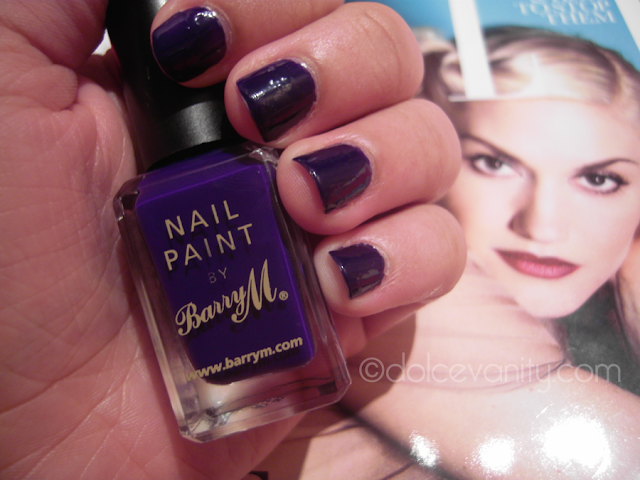 This was the first Barry M nail paint that I purchased ummm I wasn't 100% in love the application of the nail polish came out THICK even when I wiped the brush it still managed to come out quite thick ... meaning longer to dry. I don't know why I'm so on the fence with this shade, maybe because I didn't 100% get what I saw before the application...over the hours the colour is growing on me but I'm not sure if it's a FAVOURITE - resist temptation to apply everytime favourite. @Sher thank you lovely. Just the word Coral always seems to sell me lol. ..beautiful colour , so rich ..
p.s LOOOOOVE your new logo - beautiful ..